"My very small puppy in this fight says that there is a lot in Science that lets all of us live longer and better lives while there is a lot in Christianity that lets us live deeper and more meaningful lives." The "wretched refuse of your teeming shores"? First of all, Wikileaks refers to the Clinton Foundation, not to Haiti Relief Funds. And what does "resources" mean? Did she take a personal call at work? It's meaningless without details. Semi-rhetorical question: who else was interviewed for the position with the Clinton Foundation which Chelsea received? To say that she received the position as a sinecure due to nepotism is to say that even though it was money paid to her in salary, it still came as a result of funds "donated" to the Clinton Foundation. To the extent that the Clinton Foundation used any Haitian Relief funds to cover overhead, some portion of that salary originated in Haitian Relief funds. another guy named Dan: Semi-rhetorical question: who else was interviewed for the position with the Clinton Foundation which Chelsea received? Chelsea Clinton does not receive a salary for her work with the Clinton Foundation, which you can see by reading their annual, independently audited financial statements (2016, pg 43). She's also raised money for the Clinton Foundation through speaking engagements. Her donated fee is usually $75,000. Zachie-baby, search for Charles Ortel, who has volumes of documents and has been interviewed on multiple YouTube videos regarding the massive fraud perpetuated by the Clinton's octopu$$y of illegal charities that, to date, are illegal in all the states and for foreign donations. The FBI has also begun investigating, so it does not look good for any of the three Clintons nor for their donors who apparently, didn't do due diligence before handing over millions. We're talking about the BIG philanthropists -- Bill and Melinda Gates as well as foreign countries of the first world. jma: search for Charles Ortel, who has volumes of documents and has been interviewed on multiple YouTube videos regarding the massive fraud perpetuated by the Clinton's octopu$$y of illegal charities that, to date, are illegal in all the states and for foreign donations. The original IRS application included the bylaws of the Foundation, which have a broad statement of Purpose: "The corporation may engage in any and all other charitable, educational and scientific activities permitted to an organization exempt from federal income tax under Section 501(c)(3) of the Code." As this is easily verified from public records, it's not clear that Ortel has any credibility in the matter. We provided this information directly to you, jma, over a year ago, but you have failed to adjust you views accordingly. no salary, but did she receive office space? Computer? Access to clerical staff? All would be considered foundation resources not appearing on 1099 or W-2. And the original question is what, other than accident of birth, qualified her to serve on the board of a major charitable organization, and was anyone else considered? Um, it was utterly responsive to your question about her salary. another guy named Dan: but did she receive office space? Computer? Access to clerical staff? Presumably, she probably also has a desk with a chair. another guy named Dan: And the original question is what, other than accident of birth, qualified her to serve on the board of a major charitable organization, and was anyone else considered? You've obviously never heard of the phrase "money is fungible". It's a common economic turn of phrase, perhaps you should learn it. While having the Foundation pay for the wedding isn't a direct sourcing from Haiti funds, it would be incorrect to say it didn't at all. The Foundation had to take SOME of the funds (if not all) from Haiti relief, if it was paying for the wedding. It's like saying "we didn't give money to the terrorists, we gave humanitarian aid to the people in the areas they had conquered." Well, if we did that, then we gave money to the terrorists because now the terrorists don't have to spend time or money on taking care of the people in the regions they'd conquered. Money is interchangeable, it's one of its great qualities. But it also confuses people. Since we know not all the Haiti relief money made it to Haiti, and since we know the Foundation paid for the wedding, and since we know money if fungible, it is by default that Haiti funds did, in fact, pay for the wedding. Even Jonathan Katz, in Slate, recognizes that the Clintons did lots wrong in Haiti, though his piece is more apologetic than most (because he has always been a Clinton apologist) and he 'blames' the issues they faced on everyone BUT the Clintons - not surprising. In fact, when he wrote it, he'd gotten a promise that Hillary would 'respond' at some point - but she never did (at least not at the time he wrote, and I found no follow up, which is no surprise). He went so far as to claim the Clintons didn't create the world we live in - but they know how to navigate it "better" (laughable, since what he really means is they know how to enrich themselves with other people's money by engaging lots of illegal activities). So no, Haiti didn't pay for ALL of the wedding. But you'd be lying if you said it didn't pay for a portion of it. Then again, that would be nothing new for you. Bill and Hillary Clinton paid a single sum for the wedding out of their own funds through a wedding planning service, Rafanelli Events, who arranged all details for the wedding, except the guest list. There is no evidence that the Foundation paid for the wedding (which would be an illegal inurement), and the Foundation is subject to annual, independent audits. Indeed, this very thread is based on the distinction between money and "resources". "Italy: Muslims demand church bells be silenced in Genoa"
What a surprise! The die is cast, the Rubicon has been crossed. You allowed these people to invade your country and to stay in your country, what did you expect??? This is just the beginning. Your women will be wearing hijabs, niqabs and burkkas in the future just to prevent them from being raped or having acid thrown in their face. Convert or die. Stupid is as stupid does. The West is stupid and gutless and I can only conclude they deserve this and were not intended to survive. These people are from shithole countries and they are on a mission; to remake your country into a shithole country. This problem can be corrected. Italy could take it's country back. Elect strong leaders who will take serious action to stop and reverse this. Declare war and actually deploy your military and hunt down and deport anyone in your country illegally without regard to courts or complaints. You are being invaded, you are at war with the invaders, they are winning. The "wretched refuse of your teeming shores"? 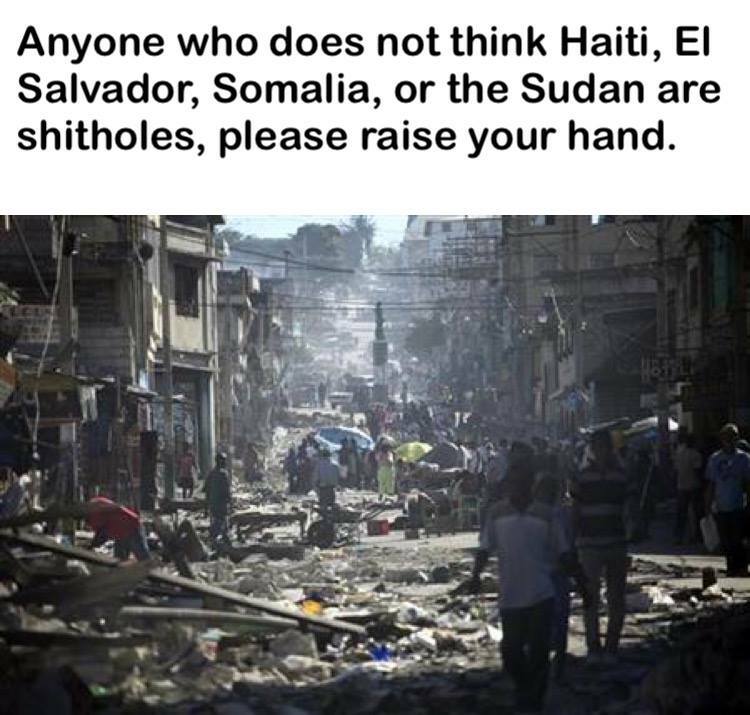 ... President @realDonaldTrump called a few places #shithole countries; you're calling the actual people "wretched refuse." The poetic line is addressed to "ancient lands" and what their powers saw as "wretched refuse" — much like how Trump sees modern immigrants. It's the same nativism that was exhibited towards previous waves of immigrants. Yeah! That's it, it's "nativism". Let everyone in or we will call you dirty names. Have you all in the basket of deplorables figured it out yet? Are you just going to remain sexist, racist, nativist, homophobes or are you going to willingly give up your country and your assets to the Socialist Democrats. The name calling and rioting and shooting cops won't stop until you give up your country and your property to the Socialist Democrats. Are you finally starting to understand what is at stake here? OneGuy: That's it, it's "nativism". Let everyone in or we will call you dirty names. It's not a matter of reasonable limits to immigration, but the xenophobia directed against certain ethnic and religious groups, as regularly seen on this very blog. 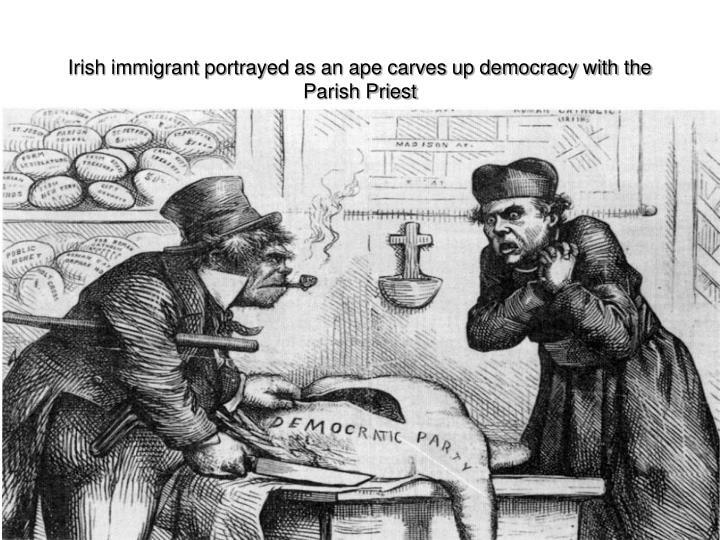 As noted, the rhetoric is the same as it was for previous waves of immigrants; Germans, Irish, Norwegians, Papists, Chinese, Italians, Jews, Japanese, Mexicans, Nigerians, etc. But the Zzzzz repeat themselves. Which "xenophobia " is that ? I taught medical students for 15 years. Some of them were black and all but one of those was not American born. The African blacks I have known think American blacks strange and don't understand them. The African kids I have met would have zero trouble with a merit based system of immigration. I guess you, like Mike Bloomberg, think we need more illegals to rake sand traps. Mike K: Which "xenophobia " is that ? The one where you condemn an entire region rather than recognizing the diversity of talent within that region. Nigeria, for instance, has been a major source of medical talent for the U.S.
Mike K: The African kids I have met would have zero trouble with a merit based system of immigration. Tell that to the U.S. President who indicated he doesn't want more immigrants from Africa regardless of talent. Except he didn't say that, kiddiez. Y'all are making it up. Gee. You can really tell the difference when the new administration took over — in 2009. It's been an almost linear improvement since then. Don't look now but support from the black community for President Trump has doubled since 2016. Zachriel, you're a little too short for this ride son. Just let us know where we're in error. Why bother pointing out your error for the hundredth time? You won’t listen. The hoops you people go through to defend socialist states, the Clintons, the Obama’s, thrully baffels the mind. I’m wasting my time even typing this. I don’t look forward to your charts and graphs link trying to prove your point. Or some other non sequitur one liner. Maybe you could crack a history book open and discover how immigrants treated themselves. Start with the Italian population in New York City. B. Hammer: I don’t look forward to your charts and graphs link trying to prove your point. B. Hammer: Maybe you could crack a history book open and discover how immigrants treated themselves. Start with the Italian population in New York City. Sure. They lived and worked in ethnic neighborhoods. By and large, the first generation spoke little English, their children were bilingual, and their children's children spoke only English. They worked hard, and became part of the diversity that makes up modern America. Russia, Russia, Russia, and the 17 intelligence agencies....you wore that one out and still can't deal with it. There's little doubt that Russia is engaged in cyber-warfare, not only against the United States, but against many other nations, including developing democracies in Europe. What, you don't remember those 17 intelligence agencies that had all that proof Trump was in collusion with Russia, Russia, Russia. It won't be long before you find that it was the DOJ, FBI, and Hillary in collusion with the Russian, Russian, Russians. indyjonesouthere: What, you don't remember those 17 intelligence agencies that had all that proof Trump was in collusion with Russia, Russia, Russia. You seem confused. The U.S. Intelligence Community determined that Russia interfered in the U.S. election process by illegally hacking the DNC and then releasing the hacked information. The U.S. Intelligence Community did not make any public statement concerning Trump's contacts with the Russians, or whether members of his campaign were wittingly or unwittingly working with the Russians. However, the Russians would almost certainly have attempted to infiltrate the campaigns, and any such attempt is a legitimate concern of U.S. law enforcement and counterintelligence, as well as of the American people. US intelligence agencies hacked the US senate ... could you perhaps inform us why they had to hack their own political system? Perhaps they are nervous over what opposition politicians were finding out about them? There is evidence and finally a confession that they lied to Congress but they have as yet to show any evidence that Russia hacked Hillary's server. Huma did send out passwords over the email system. And the Awan's accessed all the democrats email. It would seem the Russians were the least of Hillaries problems. The Uranium 1 indictments should help open up the Clinton secrets and then we can find out all about Russia, Russia, Russia. You seem you be diverting from your original claim, which was your false suggestion that someone had said that U.S. Intelligence Agencies had released a statement concerning Trump colluding with Russia. I'll credit Barak Obama with the unemployment change in 2009 when you credit Donald Trump with the GDP increases in 2017. Christopher B: I'll credit Barak Obama with the unemployment change in 2009 when you credit Donald Trump with the GDP increases in 2017. Did GDP grow at a rate of 3 percent or better during any period between 2009 and 2016? Sure. During the 2nd and 3rd quarter of 2014 real growth in GDP exceeded 4%. Other periods also exceeded 3% growth during the ObamaCare Administration. But you know what they say, "Slow and steady wins the race." Or at least is conducive to long term planning and growth. Russkies hacked the DNC server and gave the data to Wikileaks. That was a BIG error. Good to see the Zzzz can't deny their error on that one.. I don't care how insulted a country is to find out that lots of its citizens are desperate to escape and come here. I do think there's a difference between Lindsey Graham's comment, which was that we can't rescue everyone who lives in a horrible country, and what probably is a fair implication of Trump's comment, which is that everyone who's trying to escape a horrible country is tainted goods. On the other hand, lots of people currently trying to escape horrible countries for our shores are, in fact, tainted goods, and if we don't figure out how to weed out the parasites and saboteurs from the budding free-market Americans, we deserve what we're going to get. Texan99: I don't care how insulted a country is to find out that lots of its citizens are desperate to escape and come here. But you should care. Just because many people want to emigrate doesn't mean the country is a 's-------'. Most people still love their mother country, even if they left to flee war or persecution or to seek out opportunity. Nor does it make sense to insult people and their descendants the U.S. may want to do business with in the future. Texan99: On the other hand, lots of people currently trying to escape horrible countries for our shores are, in fact, tainted goods, and if we don't figure out how to weed out the parasites and saboteurs from the budding free-market Americans, we deserve what we're going to get. The best bet is to keep out the Germans Poles Irish Chinese Papists Italians Jews Mexicans Africans Muslims. I don't care. I cannot be made to care. jimg: Why? Because you say so? We provided the reasons, which you ignored. Hey, everyone knows it all started with the Irish. Now that there is just plain funny! By Golly Bird Dog, you've outdone yourself. Congratulations and thanks for keeping our little angel occupied for the whole day today, it keeps him out of worse mischief.